Vaccines help protect babies and young children against 14 serious diseases before their 2nd birthday. Even though you are keeping them safe from diseases, it’s hard to see your children cry when they receive their shots. But you can take some steps before, during and after a vaccine visit to ease the short-term pain and stress of getting shots. You may also want to bring your child’s vaccine record to show the doctor and pack a favorite toy, book, blanket or other comfort item to keep your child occupied at the visit. For older children, shots can pinch or sting, but not for long. Remind them shots help keep them healthy. Distract your child with a toy, a story, a song or something interesting in the room. Make eye contact with your child and smile, talk softly or sing. If you can, hold your child tightly on your lap. Take deep breaths with an older child to help “blow out” the pain. After the shot, hug, cuddle and praise your child. For babies, swaddling, breastfeeding or offering a bottle may offer quick relief. Comfort and reassure older children if they cry. If you notice redness, soreness or swelling from the shot, place a clean, cool washcloth on the area. These reactions are usually mild and resolve on their own without needing treatment. If your child runs a fever, try a cool sponge bath. You can also use a non-aspirin pain reliever if your doctor says it’s OK. Some children eat less, sleep more or act fussy for a day after they get shots. Make sure your child gets plenty to drink. If you’re worried about anything, call your doctor. We’re coming up on the 4th of July. Hooray for a day off with parties, good food and good times! Of course, we should never forget why we are actually blessed with this holiday. So we celebrate the birthplace of our nation with cheer, American flags, ceremonies and (of course) fireworks. In 2017, 67 percent of the estimated annual fireworks-related, emergency department-treated injuries occurred between June 16 and July 16. Almost three quarters happened in one month! According to the U.S. Consumer Product Safety Commission (CPSC), eight people died and more than 12,900 were injured badly enough to require medical treatment after fireworks-related incidents in 2017. 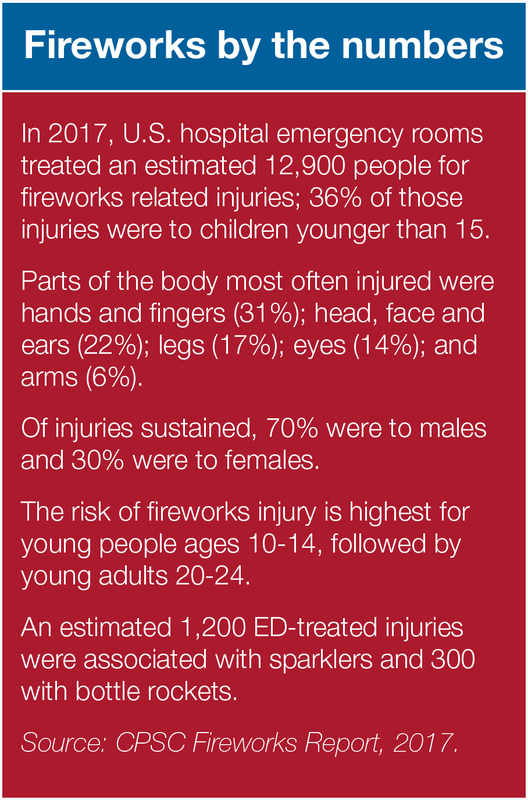 2017 saw the highest number of fireworks-related injuries in at least 15 years. Of those injuries, 8,700 were treated during that one month period surrounding the 4th of July. And if that wasn’t bad enough, 36 percent of those injured were children under the age of 15. 2017 saw the highest number of fireworks-related injuries in at least 15 years. We recommend you leave your pets at home when attending any celebration during the holiday. And even at home, you should take precautions even if your pet has never ran away or escaped before. It’s also a time when a lot of different foods are left out and are sometimes dropped on the floor. So there is a greater chance of your pet getting hold of a food that may not be very good for him. Also the ASPCA notes, that citronella-based repellents, oils, candles and insect coils are irritating toxins to pets. We want this to be an enjoyable, festive and safe holiday for you, and your family (including your pets). So please #CelebrateSafely and Happy 4th of July! Sources: U.S. Consumer Product Safety Commission, American Society for the Prevention of Cruelty to Animals, American Veterinary Medical Association. The number of Americans living with Alzheimer’s disease is growing—and growing fast. Estimates vary, but experts suggest that more than 5.5 million Americans of all ages have Alzheimer’s disease. Alzheimer’s disease is currently ranked as the sixth-leading cause of death in the United States. It is the fifth-leading cause of death among those age 65 and older and a leading cause of disability and poor health. As the U.S. population ages, Alzheimer’s is becoming a more common cause of death. It is the only top 10 cause of death that cannot be prevented, cured or even slowed. Between 2000 and 2014, deaths from Alzheimer’s disease as recorded on death certificates increased 89 percent, while deaths from the number one cause of death (heart disease) decreased 14 percent. Today, someone in the U.S. develops Alzheimer’s every 66 seconds. By mid-century, that is poised to become one every 33 seconds. Alzheimer’s is the most common cause of dementia among older adults. Dementia is the loss of cognitive functioning—thinking, remembering, and reasoning—and behavioral abilities to such an extent that it interferes with a person’s daily life and activities. Dementia is not a specific disease. It’s an overall term that describes a wide range of symptoms associated with a decline in memory or other thinking skills severe enough to reduce a person’s ability to perform everyday activities. Alzheimer’s disease accounts for 60 to 80 percent of cases. Vascular dementia, which occurs after a stroke, is the second most common dementia type. Alzheimer’s changes typically begin in the part of the brain that affects learning. As Alzheimer’s advances through the brain it leads to increasingly severe symptoms, including disorientation, mood and behavior changes; deepening confusion about events, time and place; unfounded suspicions about family, friends and professional caregivers; more serious memory loss and behavior changes; and difficulty speaking, swallowing and walking. An estimated 5.5 million Americans of all ages have Alzheimer’s disease. The number of Americans with Alzheimer’s disease and other dementias will grow each year as the size and proportion of the U.S. population age 65 and older continue to increase. By 2050, the number of Americans living with Alzheimer’s disease may reach 16 million, barring the development of medical breakthroughs to prevent or cure the disease. In 2017, an estimated 700,000 people in the U.S. age 65 and older will die with Alzheimer’s. As the population of the U.S. ages, Alzheimer’s is becoming a more common cause of death. Although deaths from other major causes have decreased significantly, official records indicate that deaths from Alzheimer’s disease have increased significantly. Between 2000 and 2013, deaths attributed to Alzheimer’s disease increased 71 percent. Approximately one quarter of dementia caregivers are “sandwich generation” caregivers—meaning that they care not only for an aging parent, but also for children under age 18. Alzheimer’s disease is one of the costliest chronic diseases to society. Total payments in 2017 for all individuals with Alzheimer’s or other dementias are estimated at $259 billion. Average per-person Medicare spending for people age 65 or older with Alzheimer’s and other dementias is three times higher than for seniors without dementia. Total annual payments for health care, long-term care and hospice care for people with Alzheimer’s or other dementias are projected to increase from $259 billion in 2017 to more than $1.1 trillion in 2050. A couple weeks ago, in our Wellness Wednesday post called UV Safety and Eyesight, we shared information about how the sun can cause damage to your eyes if you do not protect them. Hopefully, by now, your mom has recovered from your telling her she was right about not looking directly at the sun. This post is all the more timely because next Monday, the U.S. will experience its first total eclipse of the sun in over 38 years. I’m sure by now you’ve heard all about it. Maybe you’re even tired of hearing about it … or you figure it doesn’t affect you. Maybe it won’t. If you are not the least bit curious and have no desire to watch one of the coolest natural phenomena in the universe, then that’s fine … you can stop reading now. Good. This means you’re either a little curious or you have nothing else to do at the moment. Whichever one is fine. We are not judging. And hopefully while you’re reading you will even learn something in the process. So, we know the Earth spins on an axis, like a top—giving us night and day. It also revolves around the sun in an elliptical orbit once per year—giving us seasons (with a few exceptions). The moon orbits the earth once every 27.323 days, giving us the different phases from new moon to full moon. During a Total Solar Eclipse, the moon’s orbit crosses paths directly in front of the sun in such a way that from specific areas of the planet, it blocks the sun from view either partially or completely, causing a brief period of darkness in the middle of the afternoon. On this occasion, the ‘path of totality’—where viewers will experience a total solar eclipse—cuts diagonally across the U.S. through several states from Oregon down to South Carolina. This means, from those areas, the sun will become completely ‘eclipsed’ by the moon for a brief period on Monday afternoon. For those of us who are above or below those areas, we will experience a partial eclipse of the sun by the moon. So part of the sun will continue to be visible. But much like the phases of the moon, we will see a waxing and waning effect. Well, hopefully, you at least find that a tiny bit fascinating! But even if you’re not yet sold, if you plan to watch this phenomenon take place or anticipate that your friends might drag you with them to watch … you need to be prepared. There are many superstitions around total eclipses. But the concern isn’t with the eclipse itself. It doesn’t make people go mad. The sun doesn’t suddenly emit any special rays that are extra harmful. Pregnant women have nothing to fear. You may feel the temperature drop a little for that short time, but it will be brief and no different than just after dusk. The issue comes when your relaxed eyes are gazing at a covered sun and suddenly it begins to peek back out from behind the moon. You know what it’s like when you turn on the bathroom light in the morning after your eyes have been in the dark all night long? Ouch! It takes a while to adjust, right? Your dilated eyes need time to constrict and not take in so much light at once. In an eclipse, this is a similar effect but multiplied by like a million and dangerous because of the UV radiation! When you are typically outside on a sunny day, even without sunglasses (though that isn’t recommended), your eyes adjust, you squint, you look away from the sun … because it is uncomfortable! It’s a reflex. So you are never getting that full on effect of looking at the sun. During a total solar eclipse, people are purposefully gazing in the direction of the sun and as it begins to peak out from behind the moon, even for a few seconds, that can cause catastrophic damage to your eyes. In the partial phase, visible light is reduced enough that it’s no longer painful or uncomfortable to look at, so people assume it’s safe. And one of the problems is you may not even realize you have done damage until the next day. Exposing your eyes to the sun without proper eye protection during a solar eclipse can cause ‘eclipse blindness’ or retinal burns, also known as solar retinopathy. You must wear protective eyewear (or you can make a pinhole projector) if you are going to watch any part of a solar eclipse! Sunglasses are not protective. You shouldn’t be able to see anything through a safe solar filter (ISO 12312-2 compliant) except the sun itself. At this late stage, finding eclipse glasses is getting harder but it’s not impossible. Some libraries are giving them away, or you may still find them at local Best Buy or Lowes stores. You can also try online, but make sure you order from a reputable company and they specify they are ISO 12312-2 compliant. If you are in the path of totality, the moon will begin to cover the sun. Your eyes must be protected. Once the sun is completely blocked by the moon, you can take them off to view this amazing phenomenon. But be brief. This will only last minutes. Be ready to put your glasses back on because as soon as the sunlight begins to appear again, you will need to put them back on. If you are not in the path of totality, you will only be seeing a partial eclipse. Therefore, you will need to keep your eclipse glasses on for the duration of the event. The actual timing of the eclipse is determined by where you are in the U.S. It can be anywhere between 10:20 a.m. on the West Coast and 2:40 p.m. on the East Coast. Check the NASA website or your local news stations for exact times. Timing of the Total Solar Eclipse in the Philadelphia, Pa., viewing area. If you cannot get outside to experience the solar eclipse or you do not have the protective eyewear to do so, many networks are live broadcasting the event, and there will be live streams from NASA as well. American Academy of Opthalmology, American Optometric Association, American Astronomical Society, NASA and Space.com. Wellness Wednesday: School starts soon— is your child fully vaccinated? Sorry … but it’s true. It’s already August, which means back to school is just around the corner. Of course, this fact usually elicits different reactions from different groups of people, depending on age and whether or not you’re a parent. If you are a parent, you know you have a pretty long to-do list for back to school. Just make sure vaccinations are on that list.